The Bermuda Environmental Sustainability Taskforce [BEST] said they are aware of an application to further develop the Grand Atlantic site in Warwick, with the plan calling for 52 one-bedroom units in three 2-storey buildings with parking for 71 cars and 53 bikes. “Residents in the area and just about everyone who has passed by the the newly-built housing development on the Grand Atlantic site are still shocked by the assault on the senses from the unfortunate construction,” said BEST. BEST said there are several reasons to object to more development at that site, with the environmental group saying the area was supposed to contain a hotel, and the zoning of this land is tourism. 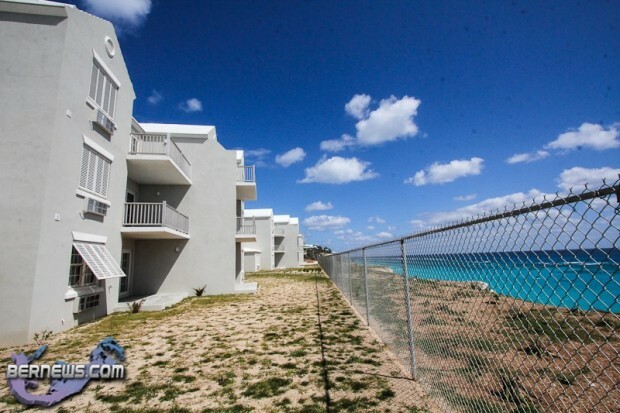 The Government had solicited of requests for information from investors and potential buyers for the property, and on Friday [June 7], Minister Wayne Scott said that five proposals for the property were received covering tourism use, senior residential use, and mixed use. The Bermuda Environmental Sustainability Taskforce [BEST] has become aware of an application to further develop the site known as the Grand Atlantic on South Road in Warwick. The plan calls for 52 one-bedroom units in three 2-storey buildings with parking for 71 cars and 53 bikes. Residents in the area and just about everyone who has passed by the the newly-built housing development on the Grand Atlantic site are still shocked by the assault on the senses from the unfortunate construction. The government indicated through the BHC that it would not be buying any more than the 78 units built so far, so any more development will be private and subjected to the regular planning process. That means that unlike the SDO that allowed the GA condos [and a hotel that never materialized], the current application can be viewed and objected to by any citizen. We encourage anyone who feels there has been enough already built at that site to submit an objection to the Department of Planning. As we understand it, this application is, like so many others these days, incomplete which makes it difficult for Planners and the public to know exactly what is planned, and where. But the deadline for objecting is Friday 14 June, 2013 at 5pm. 1. This area was supposed to contain a hotel. Instead it is yet another case in which an SDO granted for a hotel/housing combination where the hotel has never been built. The Grand Atlantic now joins the infamous examples of Palmetto Bay and Tucker’s Point. 2. There is still the very real concern about potential for erosion of the cliff-face that has not been adequately addressed, particularly related to heavy weather erosion. All the questionable issues of traffic, density, noise, erosion, setbacks, aesthetics and the overall impact of this development on an already dense neighbourhood points to the necessity for an Environmental Impact Assessment (EIA) — which should have been done before the first phase of development was approved. 3. Is there even a need for this additional stock of housing? 4. The zoning of this land is Tourism. While the Grand Atlantic SDO lifted that zoning for the condos, that SDO cannot unless amended be used for this development because, for one thing, the SDO stipulated 2-and 3-bedroom units while this development is for 1-bedroom units. 5. A traffic study is needed. Already the access/exit to the gas station is considered dangerous and ‘a serious accident waiting to happen’. Planners should know what impact can be expected from the maximum combined traffic of the existing development plus this new development plus the gas station and the row of commercial establishments across the road. 6. The development appears very dense for the lot size. Density-related issues such as noise, stress and crime ought to be examined and understood first. 7. Enough Already! The existing development is an eyesore, a blight on that entire section of South Shore. What once was the gateway to the South Shore has been ruined. No additions should be permitted. The application number is P0164/13; the applicant is Atlantic Development (BDA) Ltd.; objection letters can be delivered by hand to the Department of Planning on the 5th floor of the Dame Lois Browne-Evans building on Court Street to the attention of The Director, or sent via email to Cheryl Wright [cwright@gov.bm]. A sample letter to the Department of Planning will be placed on our website. The objections deadline is Friday 14 June, 2013.
we couldn’t even sell what we have now and they wana build more. absolutely insane. if you go back in the news, and I mean way back, this additional plan was all agreed while the PLP was in office. Agreement with Mr. Lopes. The OBA had nothing to do with this agreement I just hope thay stand strong and say no. There better be more than just BEST objecting to this insane proposal! How bout we just draw a line in the sand and knock the whole lot down. F*** OFF “BEST” U A*** ONLY SPEAK N ACT ON GOVERNMENT ISSUES,NO WORD OR RESPONSE WHEN IT COMES TO PRIVATE CONSTRUCTION COMPANYS BUYIN UP EVERY LITTLE KNACK N KRANY TO PUT UP THERE OVERPRICED HOUSES!!!!!!!!!! I believe you will find that the developer Atlantic Bermuda Development Ltd is a private company. Gilbert Lopes? Who is it exactly that has rocks for brains that wants to build these additional units ? Oh well , too late anyway . The entire area has been ruined by the existing eyesores that are going nowhere no matter how badly we want to wish them away . And what hotel investors will want to build next door there now anyway , with the existing structures and possibly more to come ? Motel 6 ? Days Inn ? Anyway , bring it on I say. These greedy landlords here still can’t figure out that no-one can afford their $2000 a month one bedroom apartments , or $1300 a month studios so maybe they will finally get it after this when their units will be worth a quarter of what they can only dream of getting and they’ll still be empty ! Bob Richards was waaay off base attacking BELCO and their outrageous charges . He should have gone after property owners. The true ‘cost of living extortionists’ . Why don’t you get a loan, buy up Grand Atlantic, and rent the apartments out at a fair low rent? Show us all how it’s done. You obviously have thought very carefully about the economic challenges involved. Renting the units wouldn’t actually be a bad idea. Toodle-oo forgets that the main reason why rents are high is because people have to pay off high interest mortgages. If construction didn’t cost so much houses would be cheaper and landlords could rent for less. Unfortunately in a capitalist society greed is the economic driver. Toodle-oo didn’t forget at all about the (overpriced) loans that have to be paid back .Or about the exhorbitantly high construction costs on houses that were already over priced in the first place. Couple that with the landlords knowing that up until recently prospective tenants were afraid of not being able to find suitable housing for loosing out on it to someone else. All that’s changed now , big time . And what about all the places that have been paid off for decades that the landlords are just now putting back on the market at the same rate that they rented for 6 years ago ? Although many will disagree with my , and other’s ,sentiments they still admit greed plays a large part. Still paying land tax on a no longer applicable ARV by the way ? I still don’t understand why you don’t borrow the money and rent those places out, if you think all other landlords are just greedy. Obviously you have a better understanding how to get less expensive finance, maintenance costs, etc. If all other property owners are ” extortionists” surely you will fill up every condo at your low rates. Any chance I , or many others had , to save up and invest were stripped away by landlords demanding their overpriced rents. We’ve been reduced to keeping our heads above water as prices on everything else keep going up like ‘everything is just normal’. There’s only ever really been 2 ways for the average Bermudian to make any money. The drug trade or real estate. Amazing how many similar things are involved in both even though one is considered legitimate and the other is not. It’s just a lot easier for one to get a leg up with the drug trade. As someone said many years ago , once you have your first house you’re on the ladder and it’s all easy after that . I know people that saved for 20 years before buying their first and only property in Bermuda. And that investment is now worth much less than it was. Are they greedy extortionists as well? They have a mortgage to pay, children to feed. You think they’re automatically rich and greedy, and they ‘have it easy’? Buying a home the old fashioned way through hard work, sacrifices and saving is very honourable. Not denying that at all. And for many it takes longer than the 20 years you mention. But was the house they decided to buy really priced fairly by the seller ? Hey ,everyone wants a decent ROI but lets not tear the azz out of it . And what happens if the house comes onto the rental market ? That’s where we normally see the gouging begin . If someone’s only home that they live in has taken a hit I would not classify them as greedy or extrotionists . Of course not. The $60m wasted on this by the PLP would be pretty useful right now wouldn’t it. Adding another ugly imposing monument to the current one that will forever remind us of a failed government,that did Bermuda wrong. Hopefully, mother nature will take it upon itself to rid these things into the ocean, creating an artificial reef, with the debris. Hold a raffle outside the place each day until they’re all gone! A plan to further develop the Grand Atlantic site? Are they completely insane? Wha??? What they’ve already established is a total nightmare. Please…no more. I drive by this disaster daily, and I’m embarrassed for Bermuda. What a joke. The whole area is ugly. Driving east you come around the bend to these ugly dwellings opposite the Sizzle, next to them is an area of rubble (where I guess they are proposing to build the next phase), followed by an gas station, albeit an new one. Opposite though is an abandoned supermarket. Not even a view to the see. This really should be a prime tourist site. Don’t even get me started on Hamilton water front. You people ever consider stand up. What a bunch of jokers. Part of the original deal for GL to build units for his own profit, not for Govt. I wonder what the cost would be to back out of the contract to develop more units… Would be nice if the contract could be legally broken without huge financial repercussions. BULLDOZE THE GRAND ATLANTIC AND MAKE A PARK FOR ALL TO ENJOY! Wow !why on earth would you want to build more condos there, if you cannot sell the one’s there present? and also was not part of the deal , condos for a hotel! !if no hotel just leave it as open space..